With terrific spirit and participation for last years’ prize, Hinckley Yacht Services is sounding a call to any and all Hinckley’s to compete for the prestigious Hinckley Trophy along with a $2,500 credit towards service at any one of their eight locations. 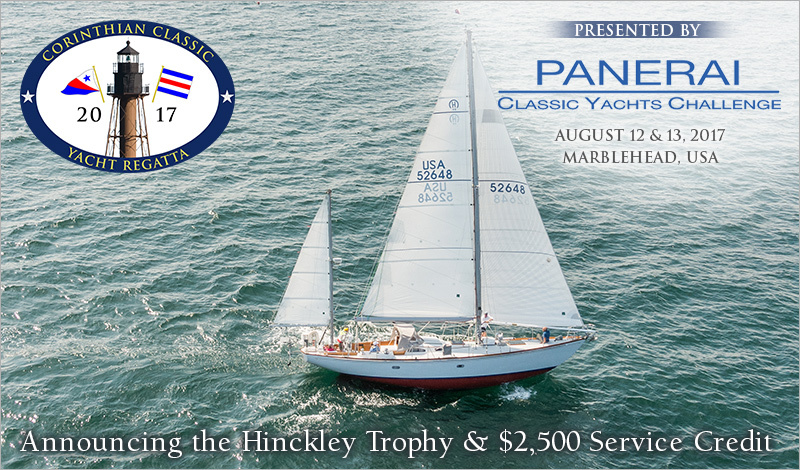 The Hinckley Trophy is awarded to the best overall performance by a Hinckley Yacht in the Corinthian Classic Yacht Regatta presented by Officine Panerai (www.panerai.com) August 12th and 13th. The 2017 Corinthian Classic Yacht Regatta presented by Officine Panerai, the title sponsor of the Panerai Classic Yacht Challenge Circuit that takes place in the Mediterranean, Antigua, UK, Marblehead, Nantucket and Newport will be held August 12th & 13th. This is an event that Hinckley supports as is obvious by the Trophy and Service Credit. Start planning now and tell a few friends – we don’t know who we’ve missed. The racing will be “low key” but it is an excellent opportunity to stretch your sea legs, put your beautiful boat on display, and mingle with those who share your Hinckley passion and tradition. Instructions to enter can be found on our website at www.corinthianclassic.org.